Chelsea took a huge step towards the last 16 of the Women's Champions League with a 5-0 first-leg win over Bosnia & Herzegovina side SFK 2000 Sarajevo. Millie Bright opened their account from 25 yards after eight minutes. Drew Spence then headed Karen Carney's corner home before Maria Thorisdottir converted Erin Cuthbert's delivery at the far post. After Fran Kirby was denied from a penalty, Ji So-Yun scored from distance and Adelina Engman added a fifth. 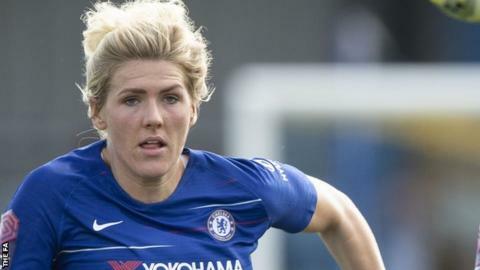 Emma Hayes' side won a domestic double last term - the Women's Super League title and the FA Cup - while reaching the Champions League semi-finals for the first time in their history. This meant they were seeded for the last 32 knockout draw and they dominated their first game against Sarajevo, second in their domestic top flight, from start to finish. The Blues enjoyed the lion's share of possession and Kirby's saved penalty was their only error in an accomplished display. The Professional Footballers Association Women's Player of the Year could have opened her 2018-19 account from the spot after she was felled inside the area, but she was able to set up Ji to fire home from 20 yards six minutes later. Engman added a solo effort two minutes after that, delivering an emphatic finish after her driving run into the box. Sarajevo: Hasanbegovic, Crnjak (Selimovic 54 mins), Djokovic, Am Spahic, Bojat (Krajnic 84 mins), Al Spahic, Kapetanovic, Medic (Kameric 61 mins), Hamzic, Nikolic, Aida Hadzic. Unused substitutes: Sljivo, Rahmanovic, Kuljanin, Mujkic. Chelsea: Telford, Thorisdottir, Blundell, Bright (J Andersson 71 mins), Carney (England 67 mins), Ji, Kirby, Ericsson, Engman, Cuthbert, Spence (Ingle 78 mins). Unused substitutes: Lindahl, Carter, Mjelde, Bachmann.